The U.S. Supreme Court this week ruled 5-4 in Janus vs. AFSCME to side with corporate special interests and harm the ability of public sector workers to collectively bargain. Today's Supreme Court decision on the Janus v. AFSCME case marks a sad day for all working people. This decision continues a long campaign by corporate interests and right wing groups to restrict our ability to stand together. While these special interest groups might be celebrating their victory against workers' freedom to join together in strong unions to speak up for themselves, their families, and their communities, union members will be using this as a rallying cry to fight back harder than ever before. The right-wing attack on union fair share fees is all about making it more difficult for working people to defend themselves when corporations abuse their power. Today's decision is an attempt to further concentrate power in the hands of the wealthy few by taking away resources from working people who are represented by unions. But there's something happening here in America. We've seen it from CWA members as workers at Verizon, AT&T Mobility, Frontier Communications, and Momentive Performance Materials have gone on strike and won gains through strong collective bargaining. Our public worker membership is growing, even in states like Texas that prohibit collective bargaining for public employees. We've stood in solidarity with teachers and other public employees in many different states, walking out and standing up to special interests – and winning. Corporate special interest groups have been working for decades to strip away workers' freedom to join together and negotiate for fair wages and benefits, and to improve our workplaces. They want to turn back the clock on achievements like Social Security, civil rights, wage and hour and safety laws, Medicare, and public education that unions fight every day to preserve. Union members will show them that nothing can stand in the way of working people standing together. We call on elected officials at the local, state, and national level to stand with working people and make it easier for them to join together in unions. Get all of CWA's information and materials on Janus here. 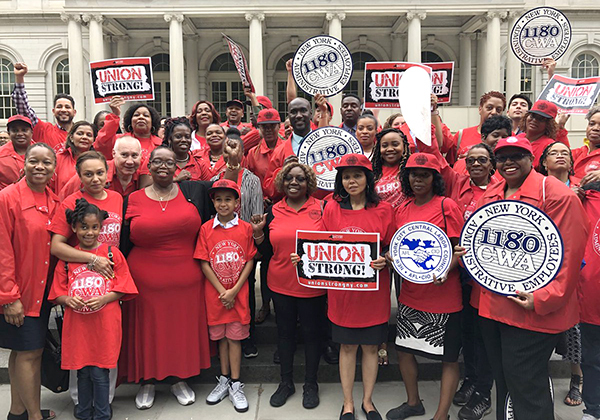 CWA members from Local 1180 rallied on the steps of New York City Hall on Janus decision day to show corporate special interests that nothing can stand in the way of working people standing together.